At BlizzCon 2017, more than 30,000 players gathered to experience the latest updates to their favorite Blizzard games and cheer on top esports competitors, with millions more joining online. 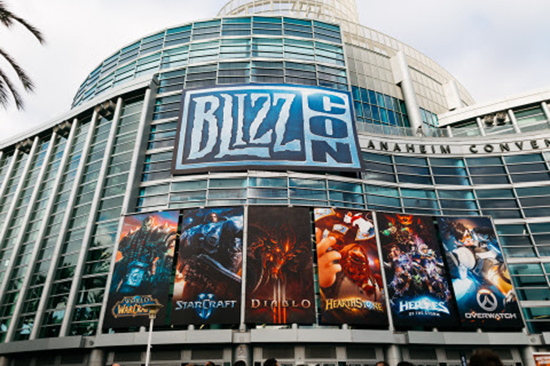 Over two days packed with developer panels, friendly competition, and live entertainment, the Blizzard community learned about and went hands-on with new heroes, new gameplay updates, and new expansions coming to the company's blockbuster franchises. BlizzCon 2017 is Blizzard Entertainment's epic annual community celebration. (Photo: Business Wire). With two championship titles already under his belt in 2017, Rogue arrived on the global stage at BlizzCon as a favorite to win the whole tournament. Once he got warmed up in the grand final against soO, he showed the world he definitely deserves the title of WCS Global Champion with a 4-2 series win. MVP Black and Fnatic met in the final match of the HGC Finals after both teams moved past the semis with 3-0 wins. When the dust settled, it was MVP Black standing tall over the Swedish powerhouse with a 3-1 victory after a barnburner of a finale. MVP Black's unwavering determination and dedication to their craft was enough to secure them their first trophy at BlizzCon. The European streak continues as ABC sweeps Panda Global in the most decisive championship match in the history of the tournament. Working against a hostile crowd, ABC triumphed behind the Arcane Mage play of Alex ‘Alec' Sheldrick to bring the WoW Arena trophy to Europe for the fourth straight year. South Korea was always expected to be the "final boss" at BlizzCon—and runner-up Canada fought valiantly in taking a single map—but in the end the story finished as expected. Ryujehong and company's sudden vulnerability didn't make a difference as South Korea goes two-for-two in Overwatch World Cup Championships. After two days of frenetic and varied play among the 12 community personalities, the Grimestreet Grifters—comprised of Andrey 'Reynad' Yanyuk, Hakjun 'Kranich' Baek, and Pathra Cadness—emerged victorious. The best-of-11 finals saw the format of each game drawn from a sealed envelope, and players were individually eliminated from the stage until the Grifters claimed the trophy 6-5 over the Chillblade Crusaders. Although Lee "Jaedong" Jae Dong and Kim "Bisu" Taek Yong's lengthy careers largely overlapped, they hardly ever played each other outside of team leagues. That changed when the two StarCraft legends met in the Ultimate Title Fight, a best-of-five showmatch with $25,000 on the line. In the fifth and final game, Bisu seemed to get a read on Jaedong's aggressive strategy, and managed to hold him off to take the series 3-2. Battle for Azeroth—In the seventh expansion to World of Warcraft, the war between the Horde and the Alliance reignites as players embark on a journey to recruit new allies, race to claim the world's mightiest resources, and fight on several fronts to determine which faction will lead Azeroth into its uncertain future. WoW Classic—In addition to a new expansion, Blizzard also announced early plans to develop a gameplay experience that recaptures players' first journeys into the original World of Warcraft. Kobolds & Catacombs—A new Hearthstone expansion, coming in December, will bring players down into the dungeons beneath Azeroth—and equip them with 135 new cards. Dungeon Runs—Kobolds & Catacombs brings with it a brand-new, highly replayable single-player game mode for Hearthstone featuring challenging, high-stakes subterranean journeys inspired by the classic fantasy dungeon crawl. Dungeon Runs are free for all players; no pre-built decks are required for entry. New Legendary Weapons—For the first time in Hearthstone, Legendary weapons are coming - and every class will get one! Free Legendary Cards—To celebrate the new expansion, all players will receive a free legendary minion, Marin the Fox, on November 6, as well as a free random legendary weapon for logging in when Kobolds & Catacombs launches in December. Eager treasure seekers can pre-purchase the new expansion card packs in a special 50-pack bundle for $49.99 and receive the jewel-encrusted "For the Hoard!" card back for free! StarCraft II going free-to-play—Starting November 14, players will get free access to the acclaimed Wings of Liberty campaign, ranked ladder play, and all Co-Op Commanders up to level five. Mira Han and Matt Horner—the newest Co-op Commander for StarCraft II's popular Co-Op mode is actually two commanders in one: command a devastating mixture of high-powered Dominion air units as Matt Horner and fast-moving ground units as Mira Han. War Chest Season 2—Following the success of this year's War Chest, StarCraft II will once again offer a fresh batch of seasonal content for players in support of StarCraft II esports. Hanzo and Alexstrasza—Two new heroes, both dragons in their own right, will bring new and dramatically different styles of play to the Nexus in Blizzard's fast-paced MOBA, Heroes of the Storm, later this year. 2018 Gameplay Update—Several in-game changes are coming to Heroes of the Storm in the near future, including a wider field-of-view camera, new Mercenary mechanics, and other core gameplay updates. Voice Chat—Players in a party will automatically use Blizzard Voice Chat (unless they opt-out) and teams will have the choice to opt-in. Performance-Based Matchmaking—Lets the player's personal performance in matches directly influence their matchmaking rating whether they win or lose. Moira—A new support hero, the life-draining geneticist named Moira, will soon be joining the roster of Overwatch, Blizzard's acclaimed team-based shooter. Blizzard World—An amusement park celebrating the worlds of Diablo®, StarCraft, and Warcraft serves as the location for Overwatch's newest map. "Honor and Glory"—The latest in the acclaimed series of animated shorts released for Overwatch takes viewers into Reinhardt's past as he wrestles with a decision of whether to answer Winston's call to join the newly reforming Overwatch. Overwatch League—The inaugural season's 12 city-based teams will sport in-game home and away uniforms and face off in the league's Atlantic and Pacific divisions. League matches will be played over four days each week of the regular season, which starts January 10, 2018. Watch on Overwatchleague.com and on the forthcoming Overwatch League companion app.